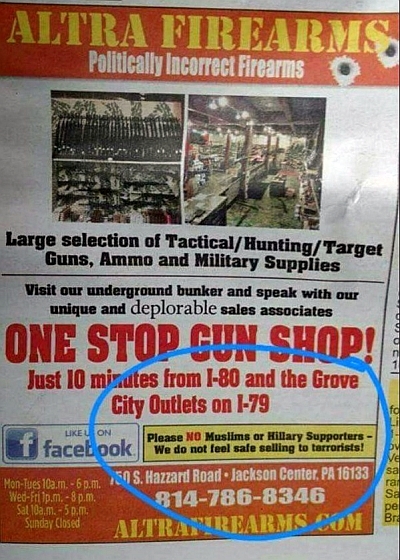 An American gun store owner has put up a controversial sign and published an advertisement in a daily refusing to sell arms to Muslims and Hillary Clinton backers, saying "we do not feel safe selling to terrorists". Paul Chandler, the owner of Altra Firearms in rural Jackson Center, Pennsylvania, said he turns customers away at his door who are Muslim or who are supporting Hillary Clinton for President. The 54-year-old business owner has posted a sign on the door of Altra Firearms conveying those rules, and he is currently running an advertisement in a local newspaper declaring: "Please NO Muslims or Hillary Supporters? -- We do not feel safe selling to terrorists!". Chandler told ThinkProgress that, as the owner of a store that brands itself as "politically incorrect firearms", he is free to turn Democrats and Muslims away. "She's clearly stated that she doesn't think Americans should have what she calls 'assault weapons' or even guns themselves," he said about Clinton. The Democratic nominee, however, has said she believes in people's right to keep and bear arms, and will not abolish the Second Amendment. "It's incrementalism. She will take one gun away and then she'll take the next gun and the next gun until finally there's no guns. So if you're supporting her, I'm not going to arm you," Chandler was quoted as saying. The stance is not new for him as Chandler said he has had a sign on his door telling supporters of President Barack Obama to "go to hell" and that he has never been comfortable selling firearms to Muslims. "They want to destroy America, they want to destroy the American way of life," he said. "And so we're putting more and more Muslims... here, and I don't feel safe arming them," he added. As for Obama and Clinton supporters, Chandler said they have clearly stated they "want to take guns out of the hands of people, and if they don't want guns in the hands of people, I'm helping them not to be a hypocrite." The US Civil Rights Act of 1964 prohibits discrimination on the basis of religion at public accommodations, although it is unclear if a gun store qualifies. In 2015, the Council on American-Islamic Relations sued a different store in Florida which declared itself a 'Muslim Free Zone'.